Studyo is an interesting app that I first learned about this week. It is billed as the modern replacement for the traditional student planner or assignment book. I have reviewed many different student organizers and student-focused calendar apps, so I thought I had seen just about everything. (See my collection of High School Scheduling and Organization resources on Participate.com) Studyo, however, is different. What makes the app really interesting is that while there is a free student only standalone version of the app, Studyo is really designed to be adopted by a school en masse. At the school level, an administrator, with the help of the Studyo team, will enter all of the course and schedule information. Studyo will actually build a custom configuration based on the data you export from your Student Management System. Once the data is configured, each student will receive a join code that they will enter in the app. The app will automatically populate all of the school schedule and course information. Students will will build their schedule by simply selecting their specific courses from the displayed master schedule. 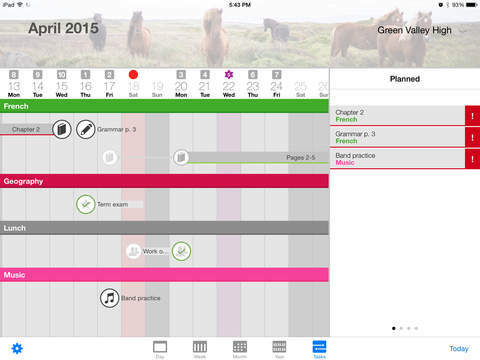 Now the power and ease of the app as a planning tool becomes evident. Students can, of course, manually add an assignment by tapping in a course for that day and entering in the details. There is a long list of task types including homework, reading, exam and activity but the app also has extracurricular selections such as sport, dance and tutoring. Once added, the task displays as a small icon inside that course. This is great, but as every teacher knows, many students do not enter assignments in their planning tool regardless of whether it is a paper or digital. Studyo, because it is implemented at the school level, solves this problem. Once the system is set up, teachers are automatically added and they can add assignment reminder and other tasks to the course and these are pushed out to students. This is an incredible way to make sure students are aware of all assignments. But what about that activity the teacher has led from the Interactive Whiteboard or even the traditional whiteboard or (gasp) chalkboard? Studyo has a built in feature that allows students to snap a photo that will be automatically be added as a task in the current course. All tasks can be viewed in a number of different ways. 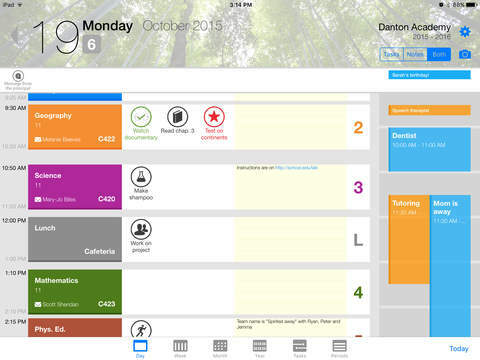 Tasks are visible by course in the daily schedule view, the calendar view, or the tasks view. The tasks view is particularly helpful be cause each task is visible in a Gantt chart format with the date created and due date as anchors. This gives students a great picture of how much they actually have going on at the same time. Tasks can be moved or the start/due dates can be edited directly in this view. Studyo did not forget about the parents either. Back in my classroom, one of the first interventions I used with students that were “forgetful” about assignments was to have them get a parent to sign their assignment notebook each night and I signed it each day. Studyo resolves this with a read only parent version of their child’s planner allowing parents to always be in the loop. Now, as you would expect, a full review of this system is difficult from my view outside of the classroom, but by carefully reviewing the standalone app and the extensive tutorials available at http://www.studyo.co I am ready to recommend this app, especially if your school is a 1:1 and is looking to ditch those paper planners. The standalone iPad app is available free, however, the school system requires a license. Pricing information was not available, presumably because Studyo is customized by school and the enrollment would cause the cost to vary. A contact form is available on their website. Looking for a way to create a classroom app? Yapp might be the answer!